Streetcars! Toronto has the best public transportation system I've seen in this hemisphere, with no fewer than four modes available: Streetcars, subways, buses, and commuter trains. There's nowhere to park, but there's no need there to own a car. There's also no need to visit with a car: You can ride a train to Union Station from just about anywhere in the country. 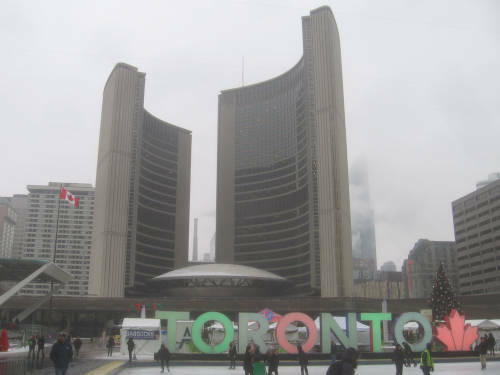 Toronto is a very walkable city, and it feels like it's planned on a human scale. The transitions between neighbourhoods are seamless and scattered with so many parks that you scarcely realize, even downtown, that you're in the centre of the world. 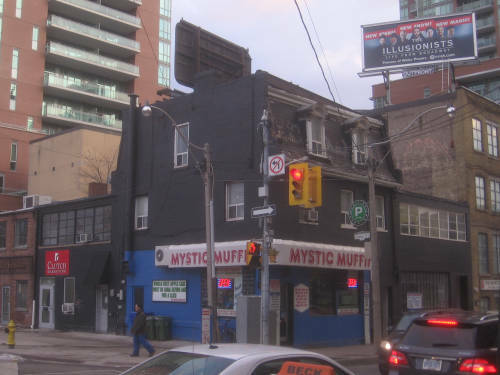 Toronto is a rail buff's paradise. Not only are there trains, subways, and streetcars galore, but there's also a railway museum in the heart of downtown. Lake Ontario has a moderating effect on the climate of the city. The streets may be clear in Toronto on the same day a blizzard blows in London. City Hall is supposedly connected to the rest of downtown by underground PATH, but security gets excited if you actually try to go this way. There is an enormous equestrian statue of King Edward VII in Queen's Park that someone had irreverently stuck a sticker to the forehead of. I didn't go inside the CN Tower. 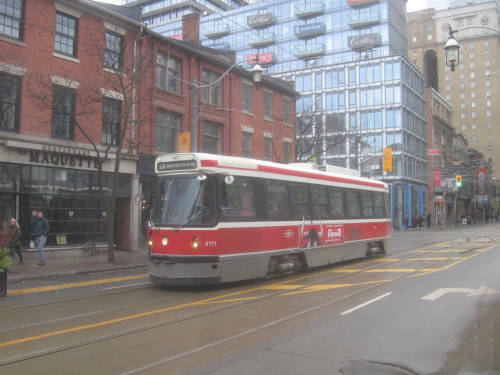 Did I mention that Toronto still has streetcars? License plate sightings were pretty slim. 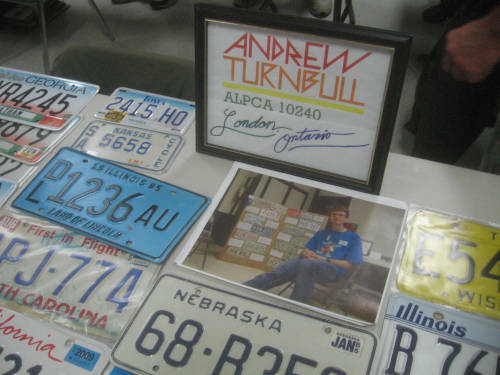 I managed to see a couple of the sought-after red Consular Corps plates, but alas they were on moving vehicles...so no photos. Toronto is a big, big place to take in. After four days, I felt I had barely scratched the surface. The organizers of Pride Toronto banned police floats from the event. Good. 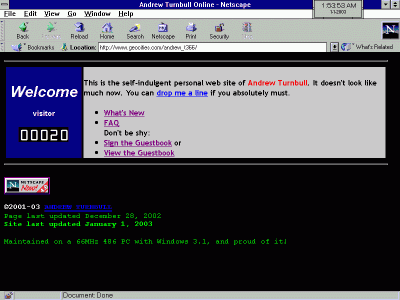 In other matters, The Andrew Turnbull Network went online fifteen years ago this week! Back in 2002, I was still in rural West Virginia and hadn't graduated from high school yet. Netscape now and forever! A third batch of Waldale-made plates has been observed in the late CD (and presumably, early CE) series. 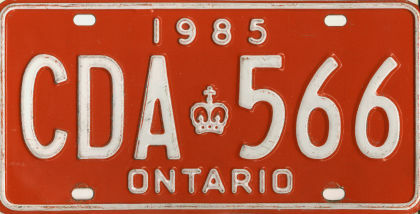 Like the second batch that surfaced earlier this year, the third batch uses a close facsimile of the Ontario die set and is identifiable chiefly by smaller boltslots and squarer corners. I've collected photographs of all the major letter series in the seven-digit passenger format from 1997 to present! With that done, I'll be free to concentrate on older plates and commercial truck plates next. I no longer live in Wisconsin, nor do I have any desire to step foot there again so long as back-stabbing white Christian bigots make up the majority of the electorate in the state. 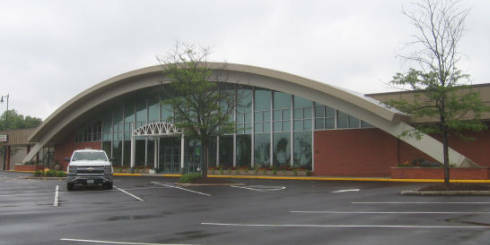 This week, however, I revisited those trodden grounds long enough to revise a page I once created to document one of the distinctive streetside architectural artifacts to be found there: Kohl's Arch-Roof Food Stores. New pictures, links, and information; from Madison, Janesville, and more. By the way, the store pictured above actually isn't in Wisconsin. It's in an inner-ring suburb of Chicago, Illinois! Hello! I'm in an end-of-term crunch, so here's a picture to hold you over until I have time for more updates. "So turn to the mirror there, and blow yourself a kiss. It goes just like this. You've done it a thousand times. 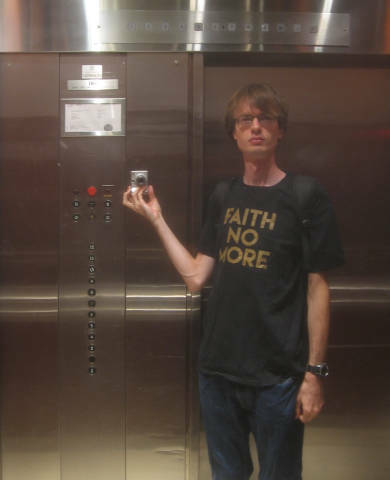 It's as easy as drinking wine, only now it's blood..." -FNM, 1987. 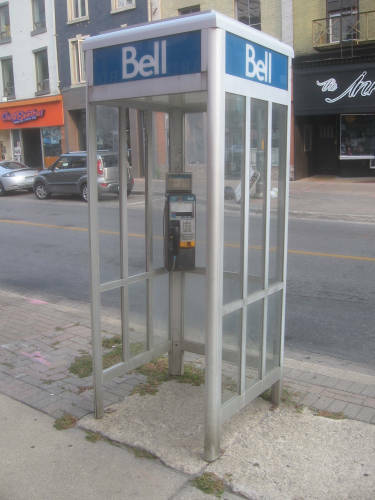 I haven't seen a public phone booth in the United States in over a dozen years. And for at least half of those dozen years, it's been excruciatingly difficult to find a pay phone of any kind. Yet in Canada, both live on. Just don't expect a door. 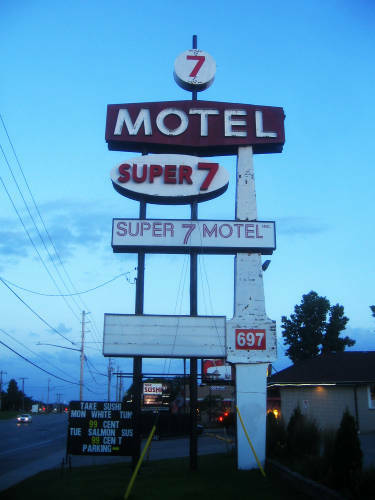 This is the glorious googie sign of the 7 Motel Super 7 Super 7 Motel in London, Ontario. It's a great sign (especially at night), but redundant redundancy is redundant. Looking closely at the sign, one can see unused neon conduits revealing alterations over the years. 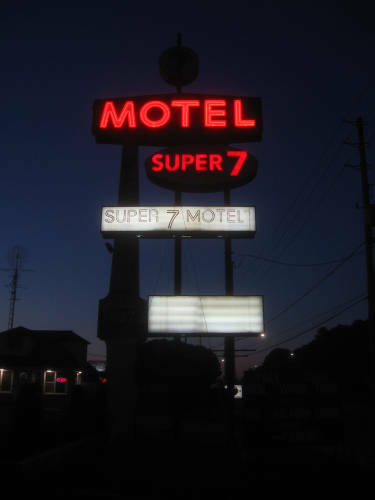 This property was originally named the Darlene Motel, and this sign is most likely an artifact of that. The old "Darlene" name may have last been used decades ago, for all I know...yet it inexplicably has a Facebook page. I'd like to give a shout-out to Parimal Satyal, who gave me a link in his essay titled Against an Increasingly User-Hostile Web. And yes, it's an important read. Thanks, Parimal! 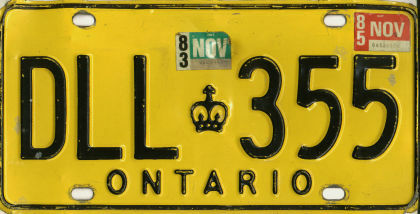 November's license plate of the month is this older bus plate from Ontario. 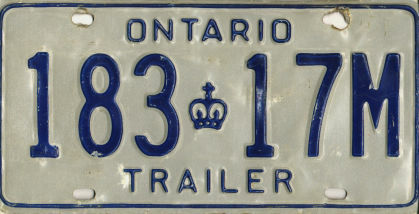 Plates of this style were issued from 1980 to 1994, and are distinguishable from common truck plates by having serials in the BA-BZ range. What's so special about this blah, black-and-white hunk of stamped steel? 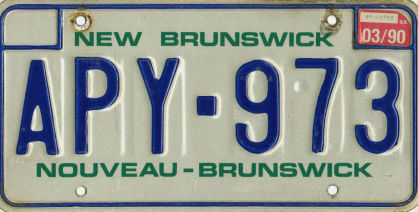 Well, older bus plates, for the most part...do not exist. 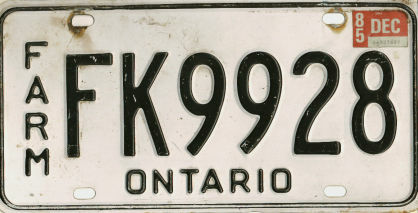 Think about it: Older-style non-reflective plates were last issued 23 years ago. You won't see them in use anymore unless 1) a transportation operator still retains quarter-century-old or older buses in its fleet that haven't worn out or rusted through after decade after decade of severe around-the-calendar use, or 2) a transportation operator transfers the plates, which isn't practical unless the operator decommissions an old bus at the exact same time a new one is put into service. 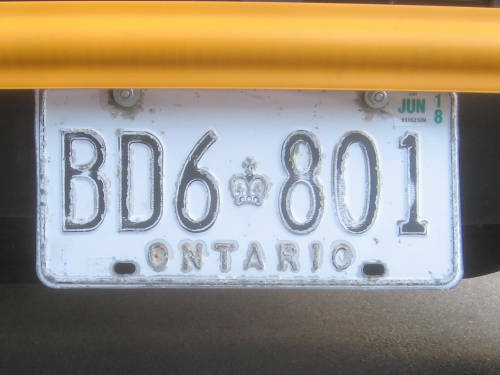 The latter scenario seems to have held true for this plate, which was fastened to a late-model school bus with unrusted bolts. 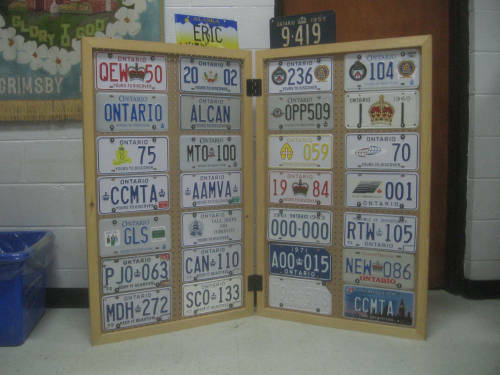 School buses rate their own class of plate in Ont ario, but a fair number of them bear regular bus plates instead. This affords the operator more flexible use provisions, such as being able to use the buses for summer activities, for a higher fee. 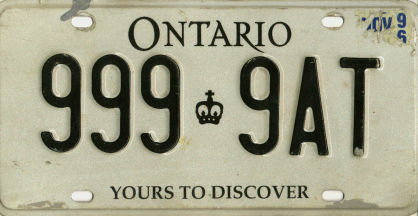 The Ontario Project has been updated, and the annal of photos has gotten big enough to split in two: Part 1 covers passenger plates, while Part 2 covers the non-passenger stuff. Part 1 has an infusion of new writing, and new sections for personalized and special graphic plates. Enjoy! I could easily spend months writing about nothing but the streetside artifacts and mysteries of my surroundings. Take these slotted metal things, for example. (I'm not sure what you'd call them: Caps? Pin-heads? Medallions?) 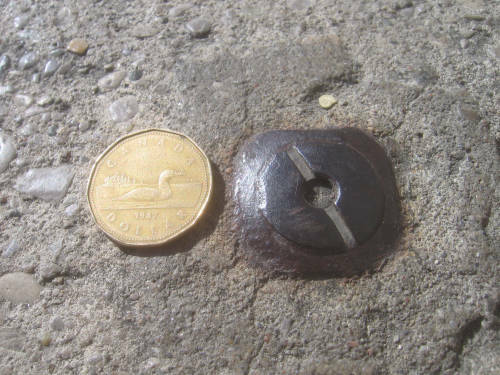 They're a bit bigger than a dollar and appear embedded in the sidewalk at various locations in downtown London, spaced at regular intervals. I have no idea what they are. They're also not unique to London. I distinctly remember seeing identical metal caps on the streets of Athens, West Virginia; my childhood hometown. At the time, I assumed these were buttons holding the road to the ground like buttons on a shirt. But I was a kid at the time, and as a kid I believed lots of things that weren't grounded in reality. When I moved to Canada to kick off my first term of graduate school two months ago, I didn't know if I'd have time to ever get out of my London confines and go anywhere else. At one point, I wasn't sure that I'd have a car. 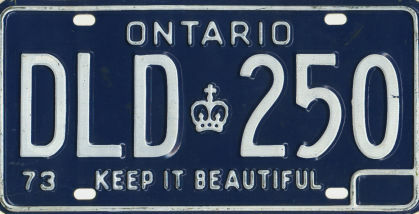 Happily, my midterm break coincided with the weekend of the annual license plate collectors' swap meet in Grimsby, Ontario. Eager to connect with the Canadian collecting contingency, I hopped in the car and drove into the sunrise. Except, the sun wasn't exactly shining. For reasons I've never understood, this meet and nigh every plate meet I've ever attended starts at 8 am...which effectively discourages everyone who doesn't live nearby from going there. My drive started at 6 under a pitch-black sky filled with rain and fog that reduced visibility to almost zero. 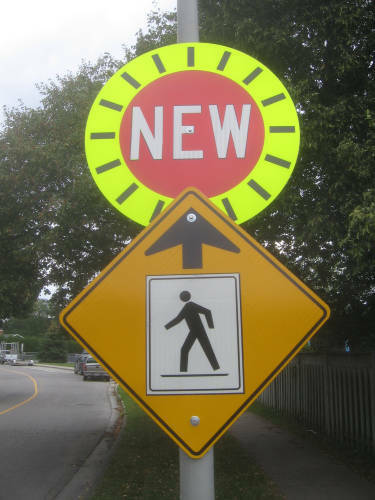 The fog was gone by the time I reached Hamilton, where confusing signage and an outdated map dumped me onto two-lane roads while trying to find the Red Hill Valley Parkway that didn't exist in 2004. Oh well; I eventually found my way! 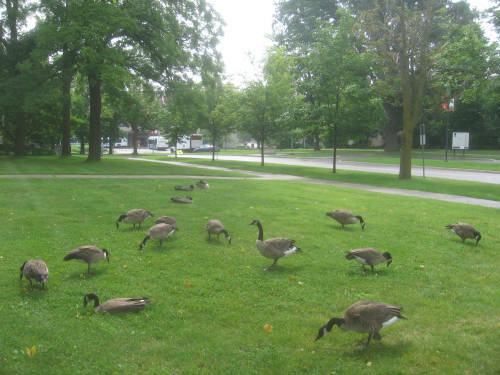 Grimsby is one of the towns that fill the void between Hamilton and Niagara Falls on the Lake Ontario shore. The hilly scenery and narrow streets remind me of some of the towns in West Virginia. 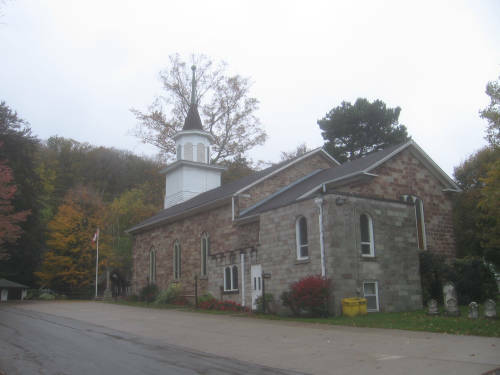 Unfortunately, the proclivities of the populace also remind me warily of West Virginia: Grimsby's area is represented by the Progressive Conservatives provincially and the Harper-spawned Conservatives federally, with all that that entails. I wouldn't want to live there. I didn't get to Grimsby at eight, but I did get there early enough to be in on the action. I was happy to see many faces, familiar and new. Chuck Sakryd and Cyndi McCabe had driven up from Cleveland. Occasional sticker collaborator Mike Franks was there, as were David Steckley, Joe Sallmen, Ned Flynn, and many others. 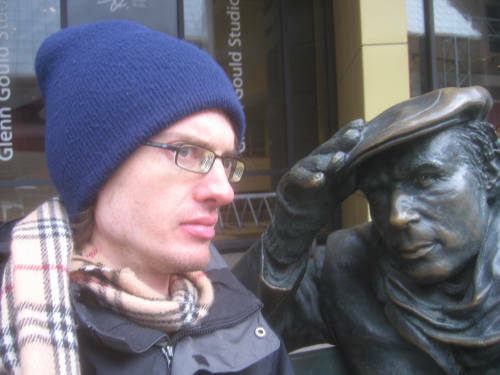 At one point I found myself engrossed in conversation with Xavier Dubé, a person I remember exchanging e-mails with many years ago. "Yes, I'm living in London now," I explained in passing. "I'm going to graduate school at Western. It's my way of getting out of the States!" "Oh," he replied. "We must have different politics since I want to get in to the States." In this age? Next thing I knew, he was laying an earful on Chuck about how "you don't know how good you have it there" (by what measure? beer prices?) only to be confronted about the brutal realities of America's lack of universal healthcare as egg dripped from his face. If I have one thing to say in response, it's this: You're not fleeing a country where your neighbours and extended family voted for a man who wants to hang you, Xavier. Your privilege shows. And good luck getting into the States, as the white-supremacist Republican Party prepares to pull the rug out from TN NAFTA visa holders and ramp up anti-immigrant measures galore. 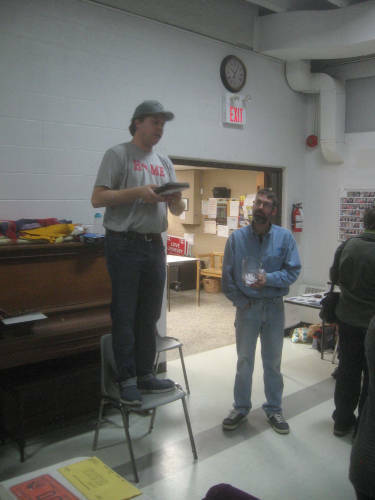 No donation auction was held (a difference from most stateside plate meets), but the event was punctuated by a raffle where Jon Upton stood on a chair and played the part of a town crier. 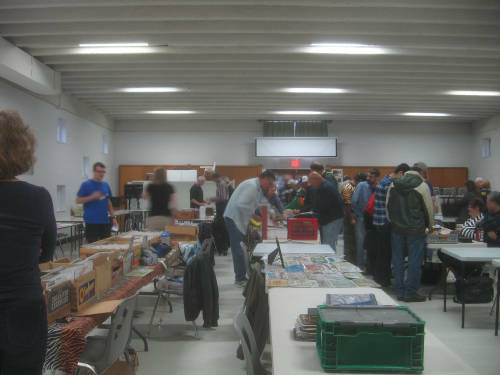 This was also one of the rare meets out of many in which I actually sold stuff...including some Iowa and Minnesota items that I never thought I'd get rid of! I doubt that I'll ever make money from this hobby, but by the end of the day my trade box was quite a bit lighter and my wallet only a little lighter than it was before. And what did I find for my own collection? Let's just put it this way: My CanCon quotient and my birthyear type set both took a good step in the right direction this day! Instead of getting lost on the way home following a road that didn't exist on old maps, I nearly got lost following a road that didn't exist on new ones: Ontario Highway 2, which was bypassed by the 401 in the 1960s and decommissioned or "downloaded" in 1998. After a brief stop in Woodstock (where I found a store offering hundreds of used CDs for a dollar a pop), I continued back to London...only to discover that the time, day, and compass were all in confluence to plant the sun directly in line with the road ahead, directly in my path of vision, nearly obliviating the sight of any stoplights! So the day both started and ended without visibility...but what happened in between was a string of moments worth remembering. 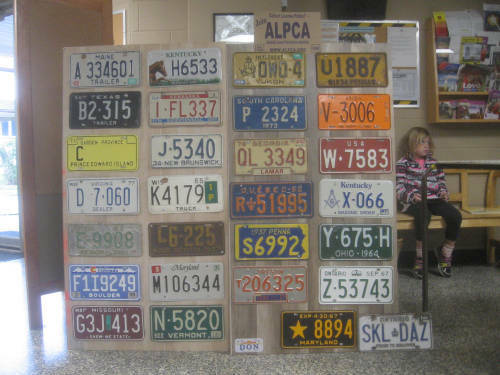 I'm back from last Saturday's license plate hobby swap meet in Grimsby, Ontario. Eric Vettoretti brought an intriguing display of impossibly-rare test plates, special event issues, and occupational types. How he managed to get them...is anyone's guess. The centrepiece of the event was this ambitious Alberta run from Mike Franks covering the last century of registration history in Canada's westernmost prairie province. The sheer variety of the first half of the display contrasted greatly with the monotony of the second half, with the transitions to multi-year plates and to the current red-on-white base (which, by now, has lasted a full third of those hundred years) being as evident as a line drawn in the sand. See you in Grimsby, Ontario next weekend. 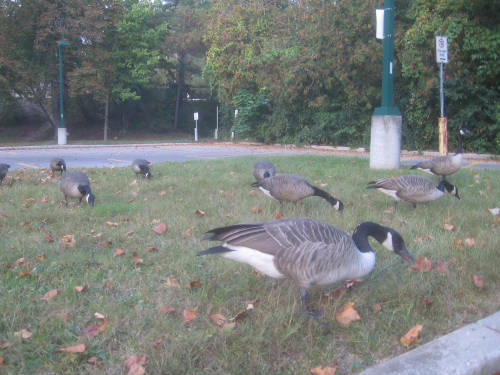 In the meantime, this post is for the birds. 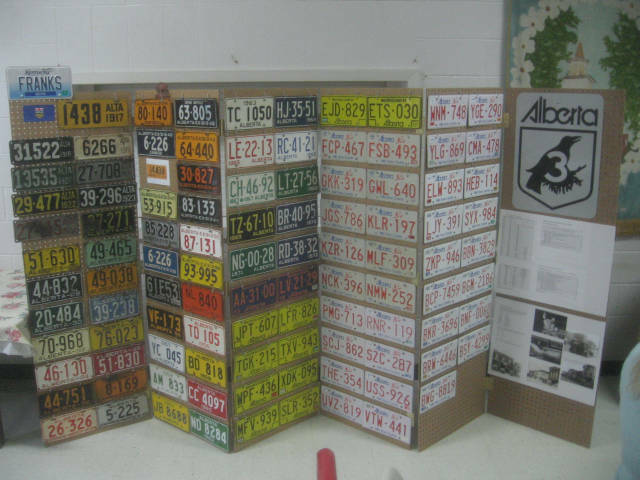 I'm not sure how this happened, but License Plate Sticker Colors seems to have become both my most heavily-trafficked page and my biggest claim to fame on the Internet. The time was right for an update, so update I did. 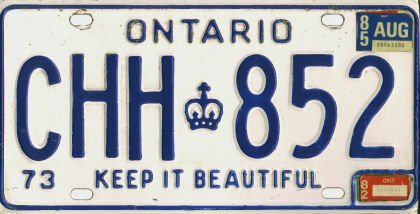 Incidentally, license plate sticker colours in Ontario are a hot mess. 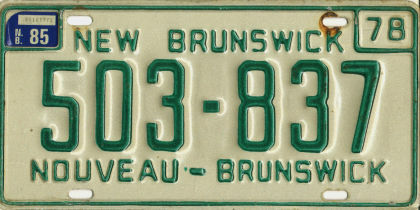 The province has ten colour schemes that it cycles through every quarter...and because of optional two-year registration and early renewal, all ten colours can appear on the roads at the same time! Just be thankful they have stickers, though: The neighbouring states and provinces of New York, Quebec, and Manitoba don't. First of all, happy Thanksgiving! November is my least-favourite month of the year, and Canadians have the good sense to schedule their holidays to avoid it. 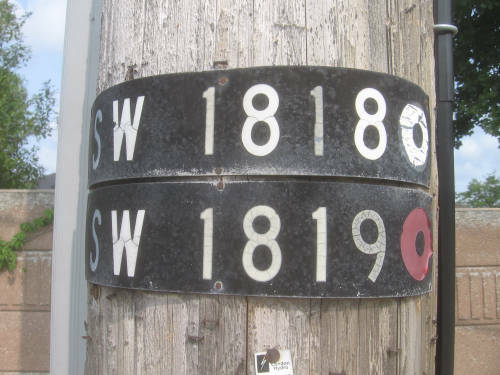 Second of all, these serial numbers appear on utility poles around the London area. 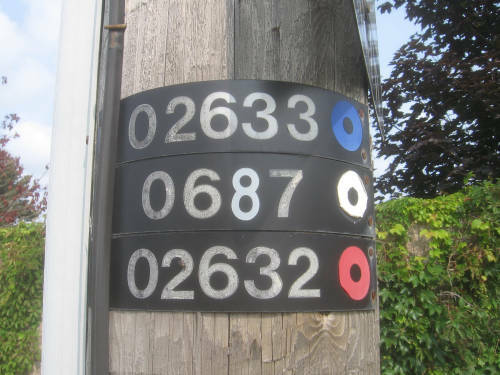 Each number is accompanied by a cryptic blue, white, or red indicator whose meaning is a mystery. My initial guess was that these coloured circles indicated different utilities such as hydro (electricity), telephone, and cable...but do they? And why are some of the numbers consecutive? Your guess is as good as mine. 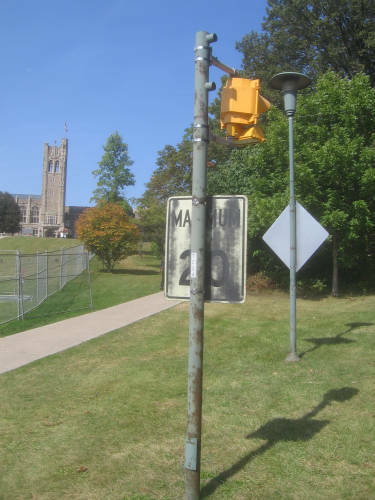 This intriguing reuse of an old speed-limit sign ("Maximum," in Canadian parlance) is yet another artifact of the past that appears on the Western University campus. My question: Given the age of the sign, is the speed on it more likely to be in kilometres per hour, or miles? 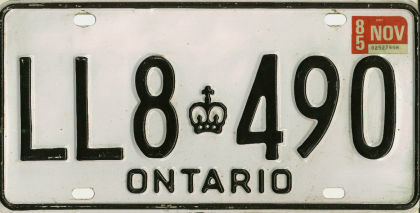 The "AAAB" series was actually the first batch of seven-digit plates to be issued in 1997: The AAAA series was made first, but held back from issue as the Ontario Ministry of Transportation deliberated over whether to auction them off as a fundraising exercise.